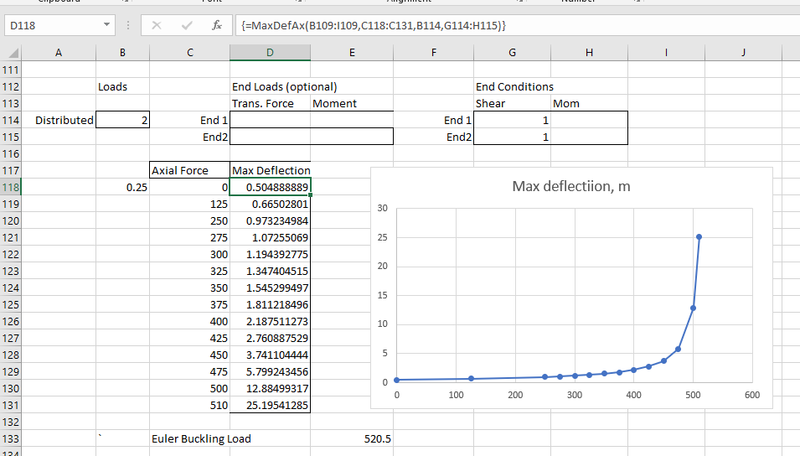 A quick and convenient way to allow for the effect of deformations on the behaviour of beams and columns under axial load is to adjust the beam stiffness matrix, so that the calculated deflections are in equilibrium with the applied loads, including the eccentricity of the axial load due to the transverse deflections. 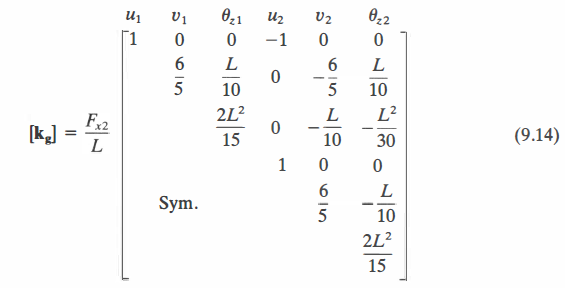 Further background to this approach is presented in the book linked in the previous post: Matrix Structural Analysis. 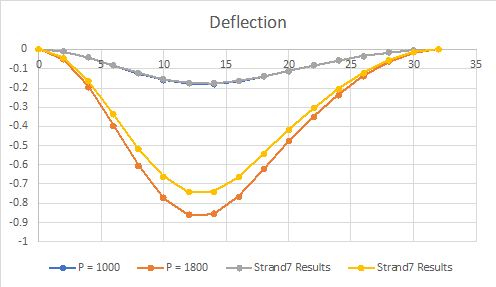 Input and output for the Axbeam function is shown below. The beam may be subdivided into any number of segments, each of which may have different materials properties. 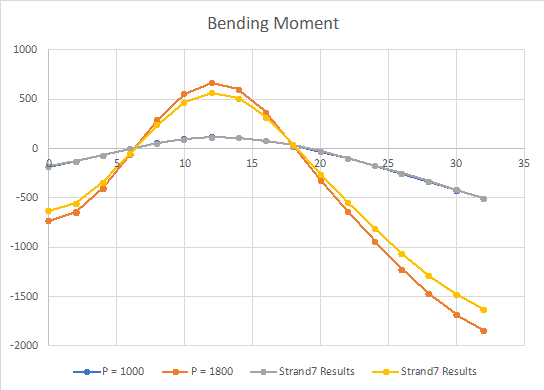 Deflections or shear forces and bending moments are output at the end of each segment. The beam end conditions may be adjusted. In the example below the moment fixity has been removed at both ends. 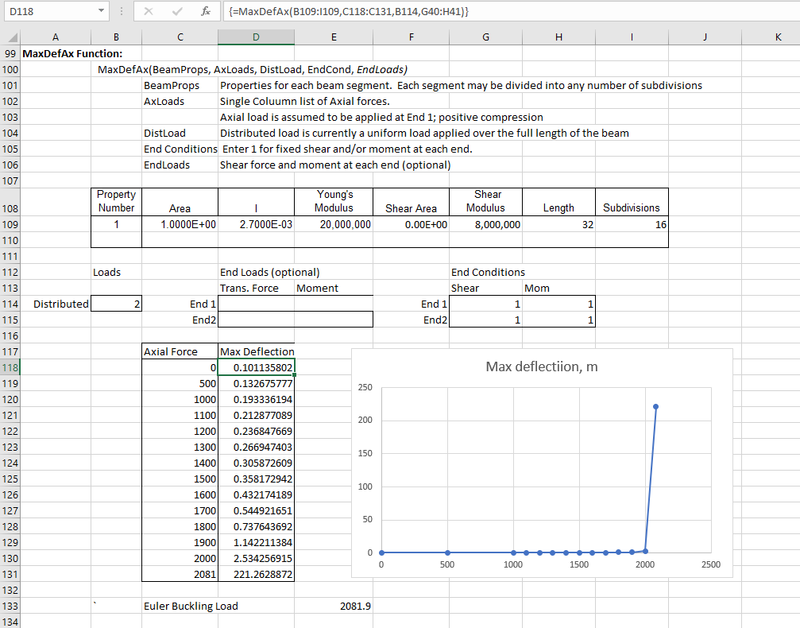 The spreadsheet buckling load again matched the Euler value almost exactly (the maximum value in the table has been reduced below the buckling load, to show the shape of the deflection curve more clearly). When one or more end fixities are released, end loads may be applied to that freedom. 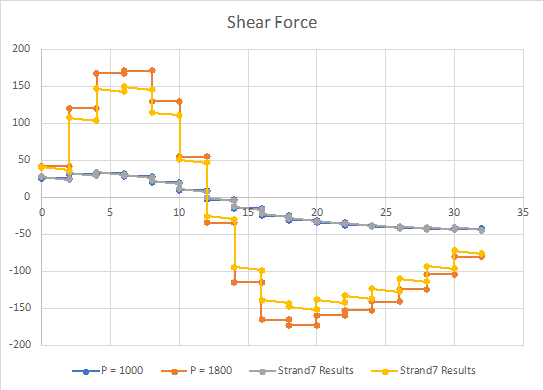 This entry was posted in Beam Bending, Excel, Finite Element Analysis, Frame Analysis, Newton, UDFs, VBA and tagged Euler buckling, Excel, Frame Analysis, Non-linear geometry, Second order effects, UDF, VBA. Bookmark the permalink. Thanks for your blog. I am not in the field o beams and things but sense a strong kindred spirit in the way you do things that aligns with my own. Your recent post on IEEE754 numbers really hit a chord for me. Thanks for that – HAVE BEEN LOOKING FOR THAT TIP FOR YEARS. 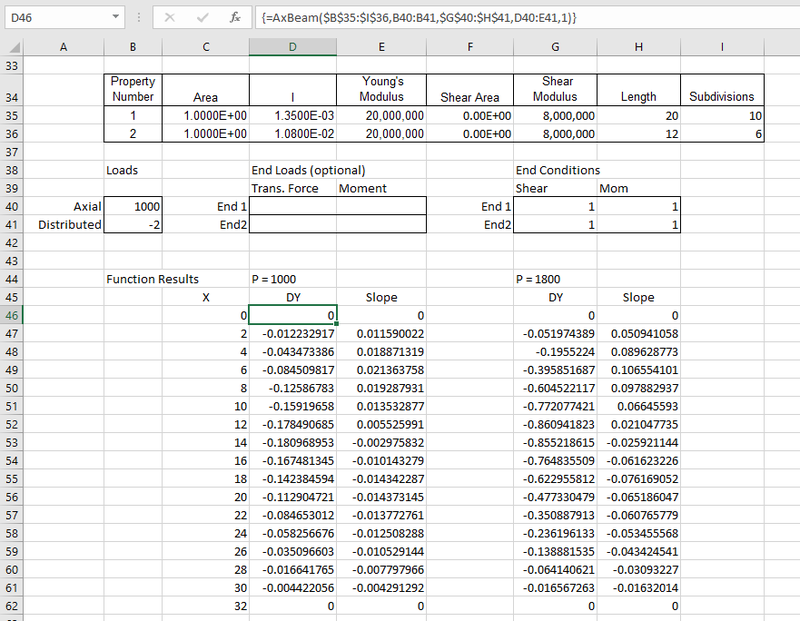 I am a mac excel user so some of the stuff you do does not come across. But this not available to me on Mac. Cannot fin any definitive answers to that. Thanks for the kind words Bob. Regarding using xlwings on a Mac, it is possible but the Mac version doesn’t support UDFs. The speed benefit actually comes from using the compiled functions available in Numpy and Scipy, and similar. Python itself is very slow, even slower than VBA in my experience, but if you have to do something like solving a large matrix equation, using Numpy or Scipy the speed-up can be huge, typically 10-50 times faster.